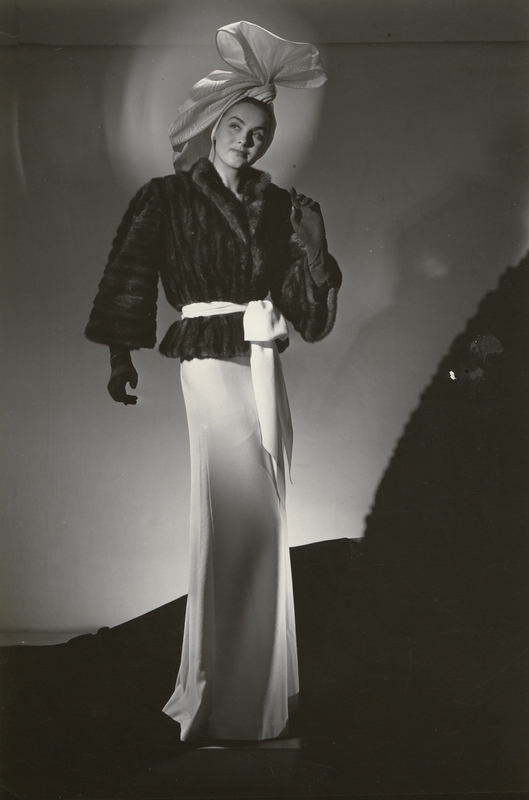 Within the whole sweep of Hjördis Niven’s life there are many areas of specific interest; such as her marriage to David Niven, her life in Hollywood, her friendship with Princess Grace of Monaco, the careers of her nieces Pia and Mia Genberg, and her years as a fashion model in Sweden. Hjordis’ girlish day-dreams did not revolve around modelling, and her marriage fantasies didn’t extend beyond getting hitched to a doctor. Even being ‘discovered’ at the age of 17 to front a brief face-cream promotion doesn’t seem to have sparked any desire for life as a model. Instead, her breakthrough at the Nordiska Kompaniet’s Leja store in Stockholm came from answering a job advert – after other career avenues hadn’t worked out. Once accepted, she found that she was a natural. 15th March 1945, Damernas värld. Hjordis Genberg and Kim Andersson modelling Paris fashions. Hjördis’ biggest influence was fellow NK model Kim Andersson. According to Hjördis’ niece Anette, her aunt always thought of Kim as a special friend. 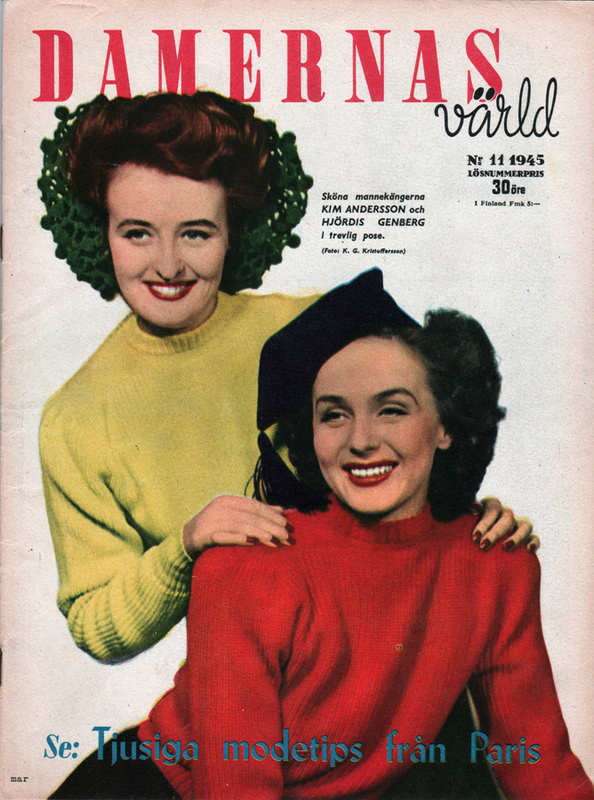 Both Hjördis and Kim have been referred to as Sweden’s first supermodel, although Hjördis’ pre-Niven celebrity status hit its peak in 1946, when she had already given up her career and become Hjördis Tersmeden. “My managers, Kurt Jacobsson and (dress designer) Pelle Lundgren were very kind to me and my colleagues,” Hjördis recalled. “They cared about us, and were always willing to assist when we needed help or advice.” Even after her modelling years Hjördis remained a friend of Pelle Lundgren and his family. 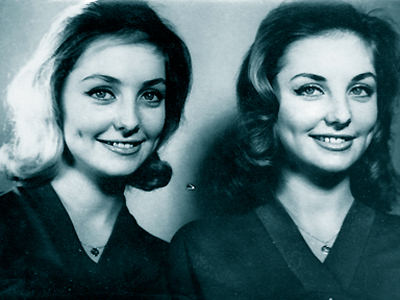 In 1957 Kim set up a modelling school, ‘Kims Stil’, which was attended by Hjördis’ nieces Pia and Mia Genberg . She also set up The Swedish Mannequins’ Association. “Their private life must be beyond reproach. The model lives in a showcase. If she has a drink, people say she has had three. 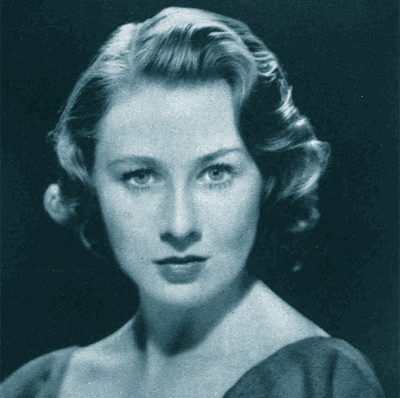 So she must learn how to refuse gracefully, and, if she has not acquired old-fashioned standards of modest behaviour at home must acquire them now.” [Without any proof, one of David Niven’s friends told Graham Lord that Hjördis acquired a bad reputation for “alcoholism” during her modelling days]. 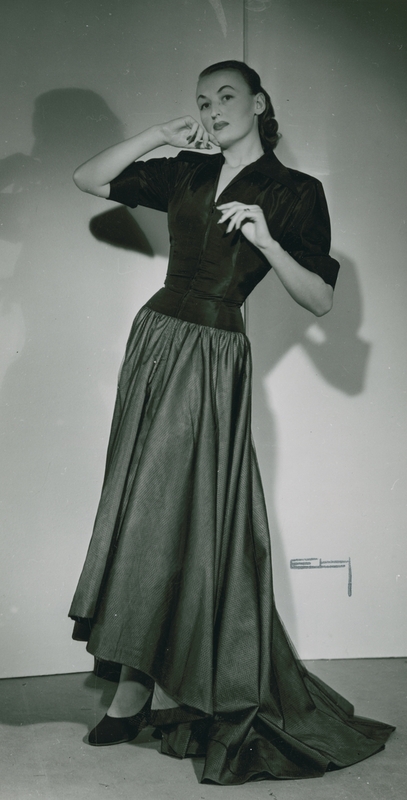 As an example of the top pay rates, the “Queen of the Swedish models” in 1955 was Louise Lindkvist, who claimed to be the highest paid model in the country, earning up to $200 a day ($1900 in 2018). She pointed out that was due to a lot of quick-changing, as models were paid by the dress. 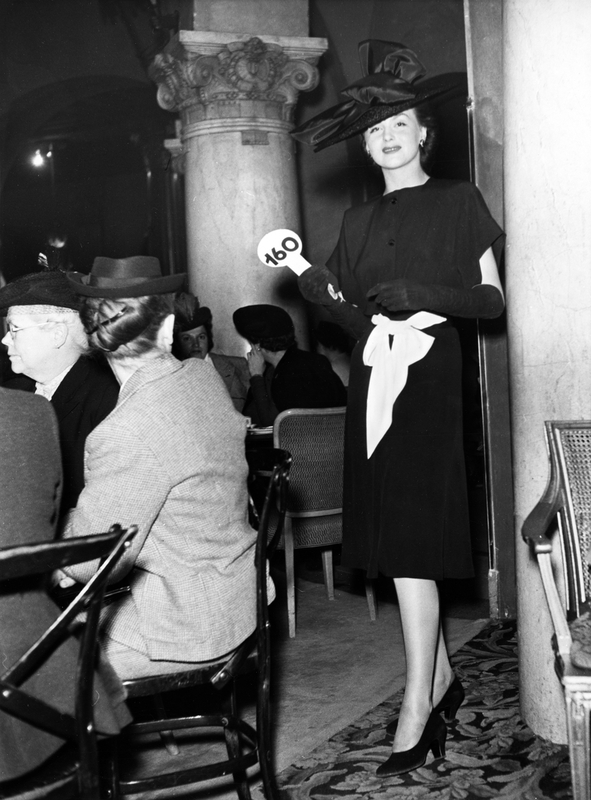 During the busy seasons she was modelling 50 outfits a day at $4 a pull-on. Ingrid Goude was quick to point out that it wasn’t her blonde hair that got her noticed: “Hollywood very much likes blondes, but when I was a model in Sweden I dyed my hair black, because in Stockholm gentlemen prefer brunettes.” Even Hjördis’ red hair became noticeably darker during her modelling days in Stockholm. 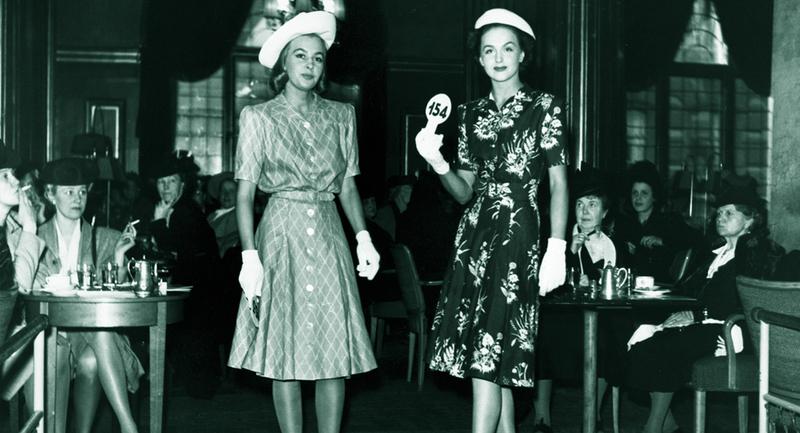 Former teen-model Anita Ekberg’s movie break came after being crowned Miss Sweden 1951, and Ingrid Goude was offered a contract when she became Miss Sweden 1956. Once in America, Ingrid Goude became aware of differences in make-up. 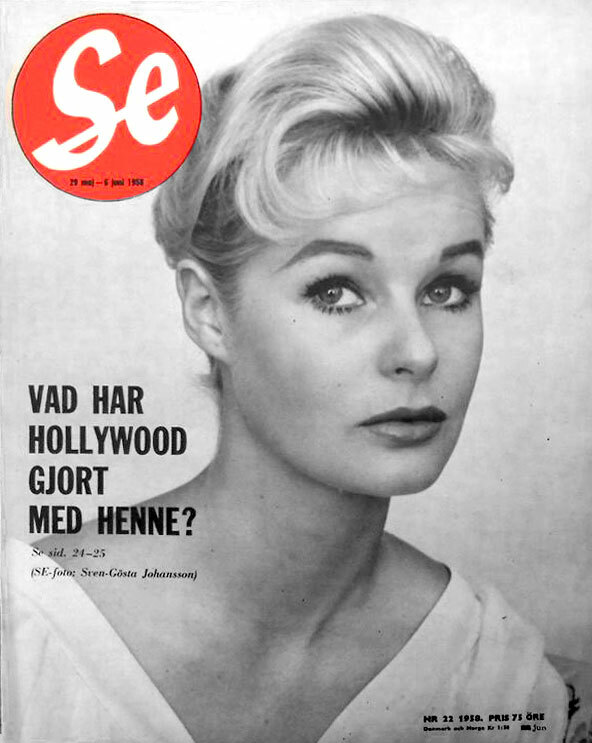 “I was a model in Sweden, and I realise now that I wore too much make-up,” she mentioned in 1957. “It is more flattering when you learn to get the same effect with only a little. And I very much like the pale lipsticks. The shades that I used to wear seem too bright and artificial now.” Wearing too much make-up was something that was frequently thrown at Hjördis during her marriage to David Niven. It’s also worth pointing out that despite a newspaper comment attributed to David Niven Jr. in 2009, Hjördis was not a former Miss Sweden. 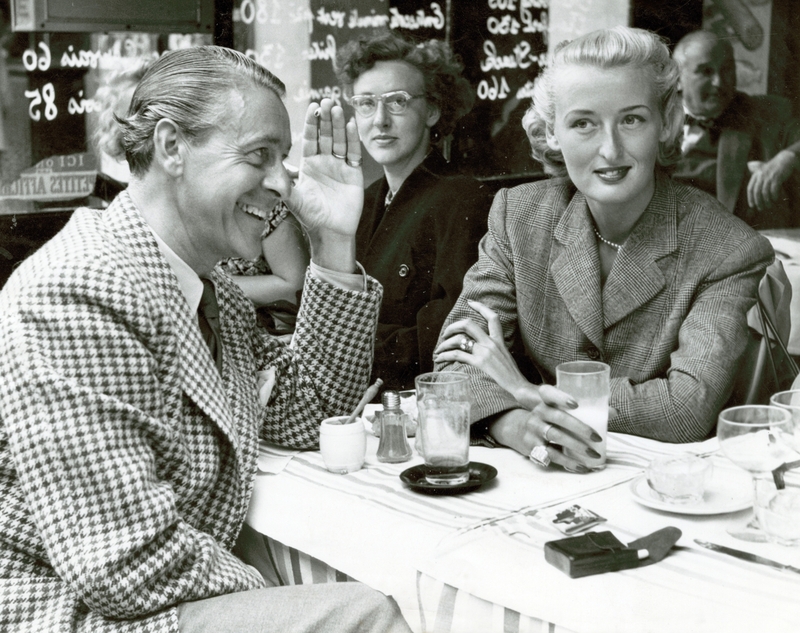 The contest only began in 1949, by which time she was already married to David Niven Snr. 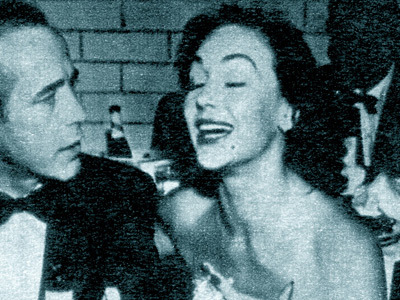 Humphrey Bogart with Hjordis Niven, at an Oscar night celebration in Romanoff's. Was it difficult to have a happy marriage in Hollywood? "It was almost impossible. One evening a big star gave a party honoring couples who had been married more than 10 years. We showed up with about 50 other couples, and everyone that I knew had either been or was being unfaithful to the other. But these were the survivors." Hjördis Genberg Niven Blog at WordPress.com.